If you didn't hear, Mayor Rahm Emanuel has declared today Talk Like Shakespeare Day. Are you a fan of the Bard and his numerous works? Head to Navy Pier, today, April 23 for Talk Like Shakespeare Day. 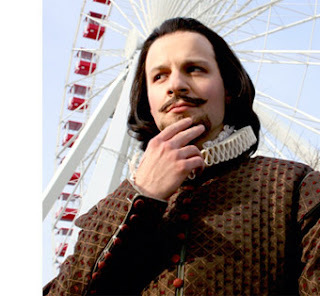 From 10 am till noon, anyone who can turn an couplet, wax poetic, or just recite a line or two of Hamlet, will receive a free ticket to the Navy Pier Ferris Wheel. Even if you can't remember a Shakespeare work, throw out some thees and thous and I'm sure that you will get a free ticket. Harry Carey' Tavern restaurant will be celebrating Talk Like Shakespeare Day day as well. The restaurant will offer a Bard-inspired menu. Today you can enter to win a Navy Pier Family Four Pack. This prize includes $100 Gift Certificate to Harry Caray's, 4 Pier Park Passes, 1 Free Parking Pass and 4 tickets to Chicago Shakespeare Theater's Disney's Beauty and the Beast. Even if you can't make it to Navy Pier today or you don't live in Chicago your family can join in the Shakespeare fun. For some great ideas from the Chicago Shakepeare Company, please see the How to Talk Like Shakepeare List.